Every year, a vast amount of complex and expensive repair has to be undertaken on mineral buildings e.g. bridges, motorways, garages and tunnels. VARIPHOB TOP CRM penetrates deeply into the substrate to provide long-term, durable protection, primarily to concrete. It prevents these elements from adverse influences such as salt efflorescence, frost / thawing damages, corrosion and algae or moss. Superior protection for buildings. VARIPHOB TOP CRM is certified to EN 1504-2 as a hydrophobic impregnation suitable for surface protection systems. 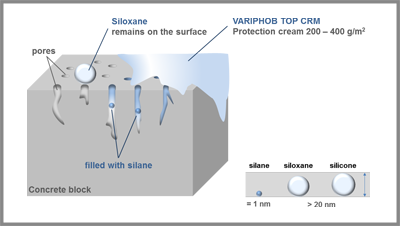 VARIPHOB TOP CRM is the cream of an aqueous, solvent-free emulsion of silane and polysiloxanes. The innovative product has an excellent penetration capacity and provides hydrophobic properties to alkaline substrates. VARIPHOB TOP CRM strongly reduces the capillary absorption power of the treated surface but does not clog the pores. 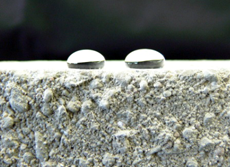 The salt absorption of the hydrophobic surface is additionally reduced. Thanks to the strongly thixotropic behaviour of VARIPHOB TOP CRM high coat thicknesses can also be applied on vertical or horizontal surfaces. VARIPHOB TOP CRM has an excellent protective effect against alternating frost/ de-icing salt strain. VARIPHOB TOP CRM is suitable for alternative construction applications. However, the product is mainly used for mineral buildings such as bridges, motorways, garages and tunnels.